This March 2nd, you have a chance to change the lives of cats, dogs, and other animals with nowhere else to turn. Please join us and be a part of this exceptional event. Over 200 special guests will enjoy an evening filled with fun and celebration including a catered dinner, heart-warming stories about the life-saving work at the shelter in Healdsburg, silent and live auctions, and a fund-a-need paddle raise. Humane Society of Sonoma County, established in 1931, is a donor-supported safe haven for animals. We provide compassionate care for more than 2,600 animals each year. 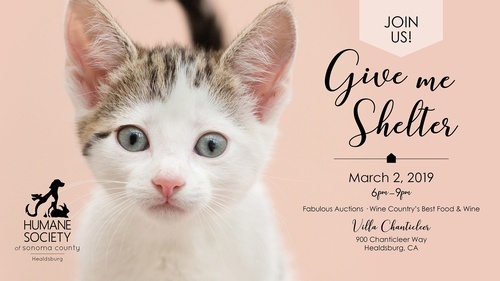 Proceeds from the Give Me Shelter event will provide medical care, behavioral support, socialization, adoption services and abundant love for all the animals. Help us continue to provide a safe place for lost or injured animals to find their families, and help families facing hardship feel confident that their beloved pets will be well-cared for on their way to new homes.